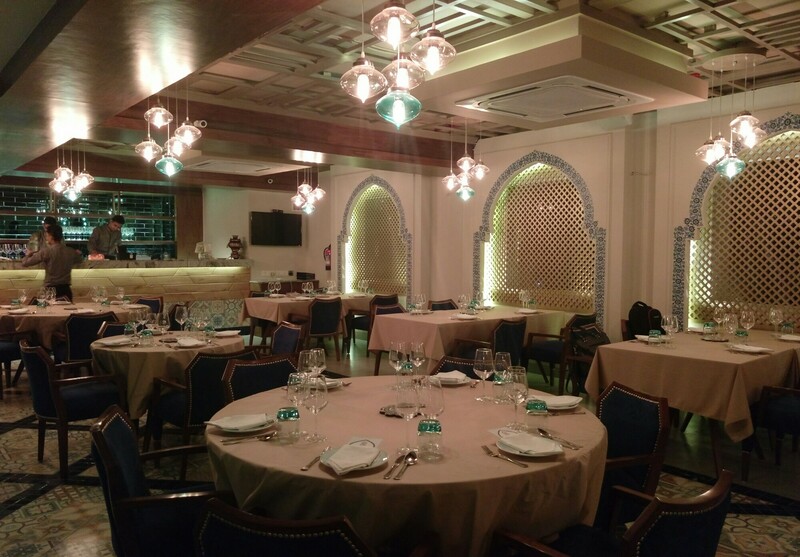 Just launched in the Capital city Delhi, this Mediterranean cuisine is a great destination for a cozy evening, a romantic dinner getaway from the hustle of daily routine and great fine dine hang out option for some family time with food that is truly outstanding and cuisine authentic to the core. 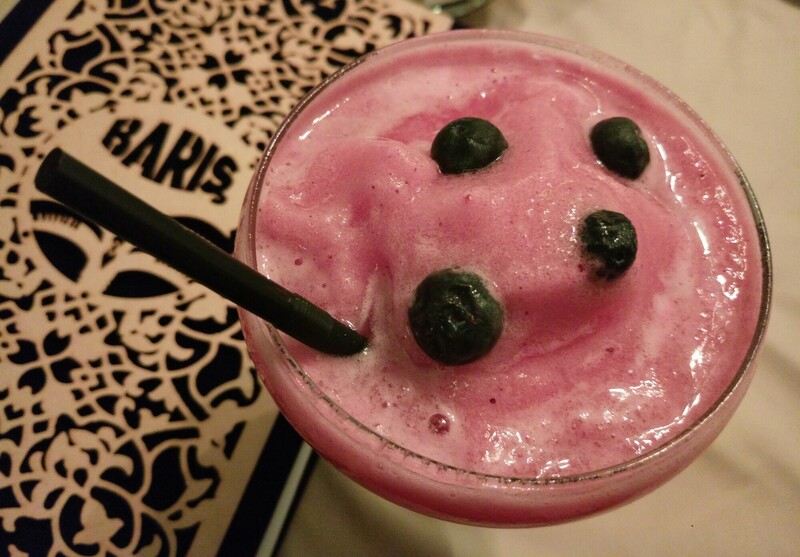 “Baris” meaning peace in Turkish, this place truly stands for it with an Ambience that’s completely in sync with it. Lots of sign board but still you might not find it that easy to locate this place if you have not been to this place earlier. 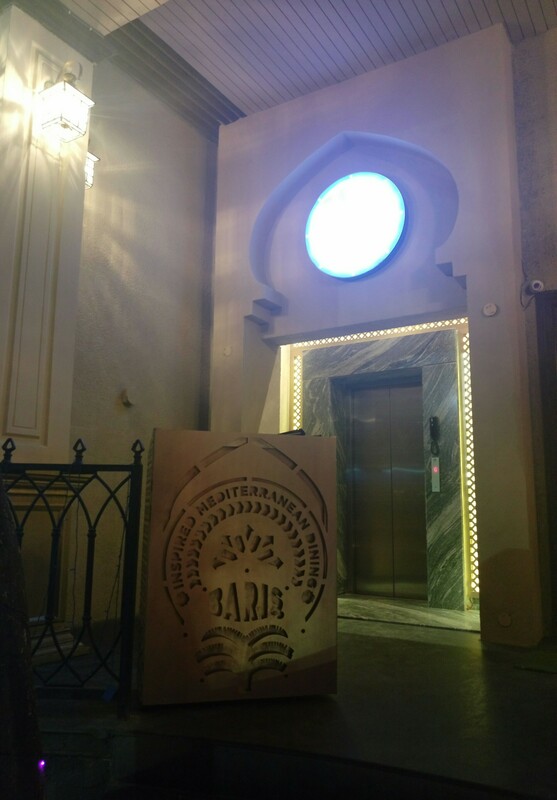 This new restaurant on block is just next to Zoe in GK 2 and the operational hours are 12:oo to 3:30pm and then 6-12:30 am meaning only lunch and dinner experience so be careful of time while you drop in here. 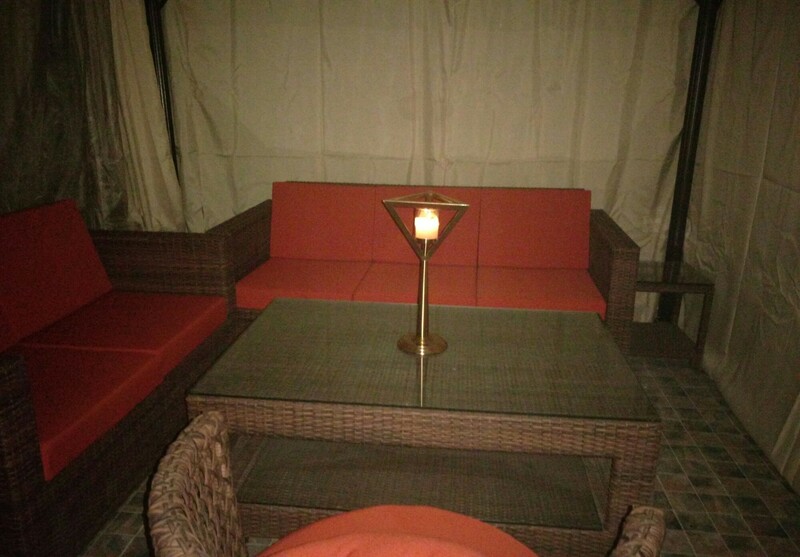 And if you are fond of open air sitting then evenings are the best place here. 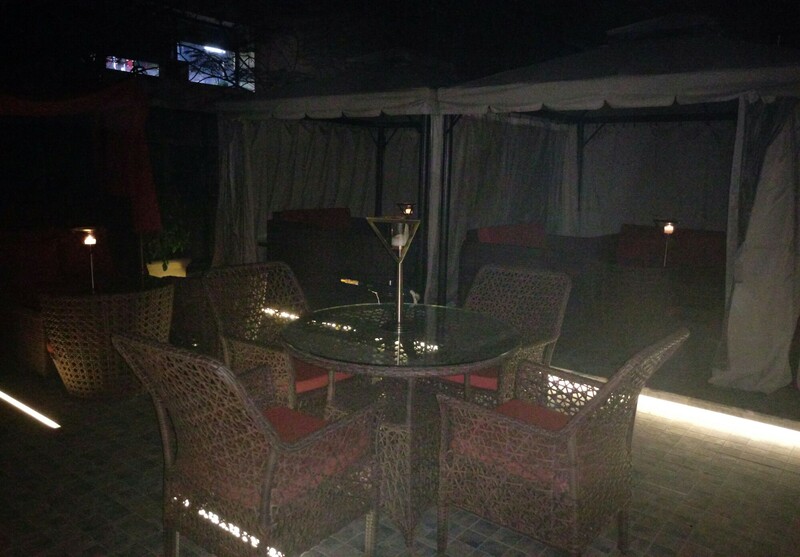 Open air terrace sitting for ur kind of space with hookah. 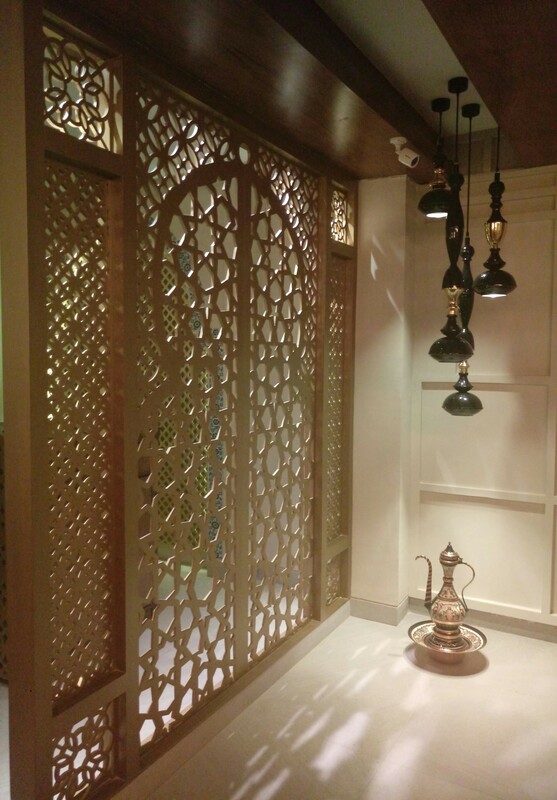 Loved the interior of this place giving it a classic royal touch with lots elements with modern yet antique look.A look that is inspired by the cuisine it caters from Mediterranean to Turkish to Middle East. 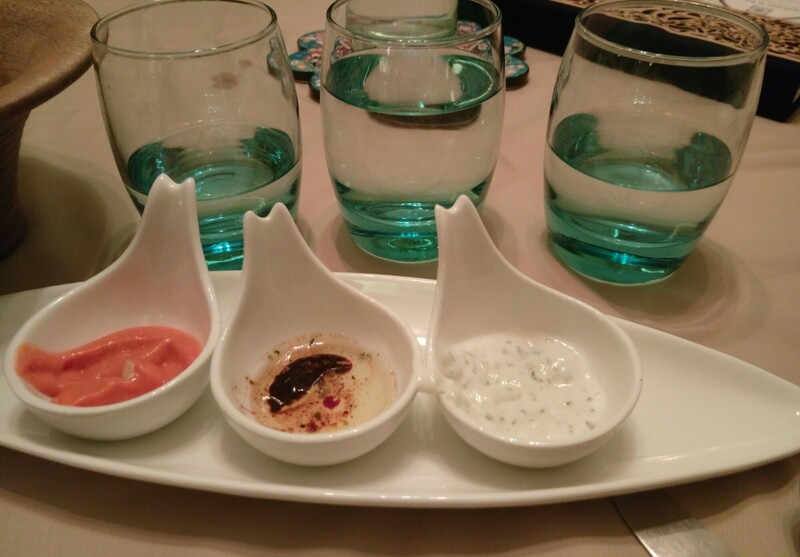 Serving starts with these dips – Almond taratora,Olive oil pomoglazed dressing, Dill (pulses) and cucumber dip along with a bread basket. Some mocktails before we start hogging on to food. So this one I had was more like a slush with salted glass. And served with fresh berries. Moving to the delicious food we tried but even before we could we were served with palate cleanser and the only condition Manish mentioned while serving it to us was “have it one shot like shots“. 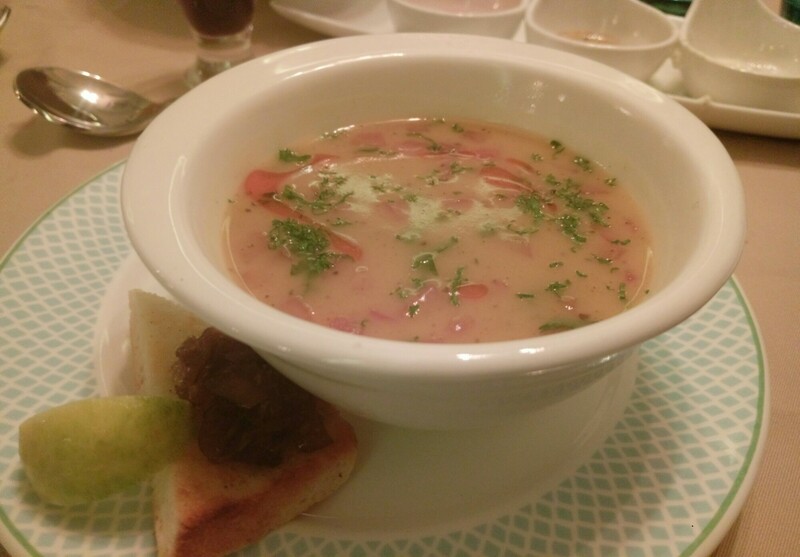 A Turkish version of soup , this is made of traditional red lentil ( masoor dal without chilka ) with glazed onion and croutons. Just to clarify croutons are sauteed rebaked bread served with soup and this one had some caramalised onion with a slice of lemon. 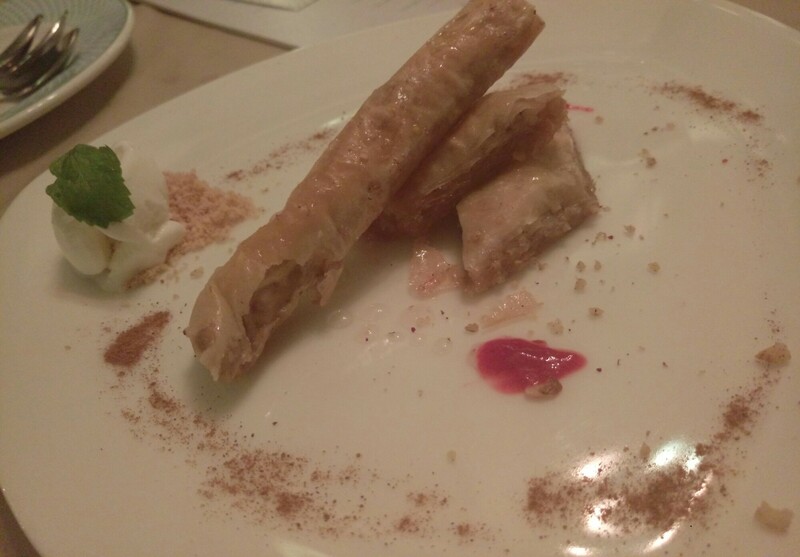 Cigar Borek – don’t worry that’s not for smoke but it’s a very very delicious dish that derives its name inspired by its appearance that looks like a cigar. 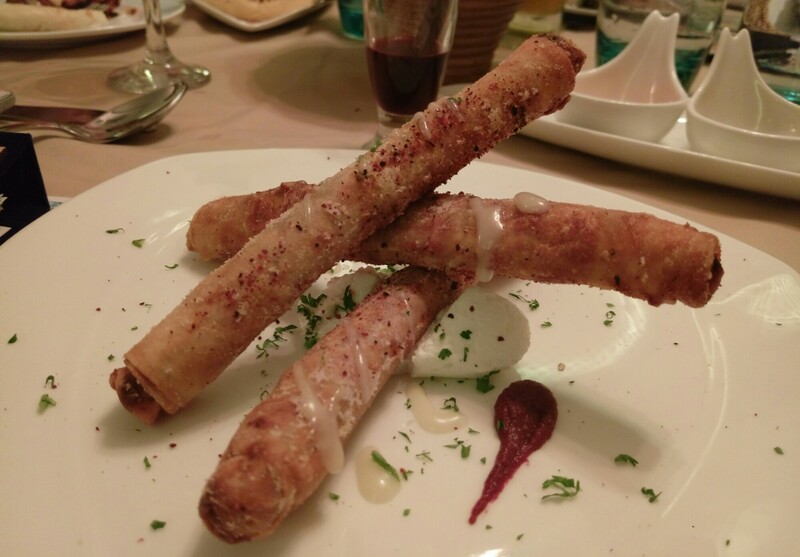 These are crispy cigar rolls with filling of feta cheese, caramalised onion , parsley is served with a cacik sauce. And trust me this is a must try dish here. Perfectly crispy and with a yummy filling within ,tastes amazing with Cacik sauce. So what is cacik sauce, well it’s a Turkish preparation with curd. 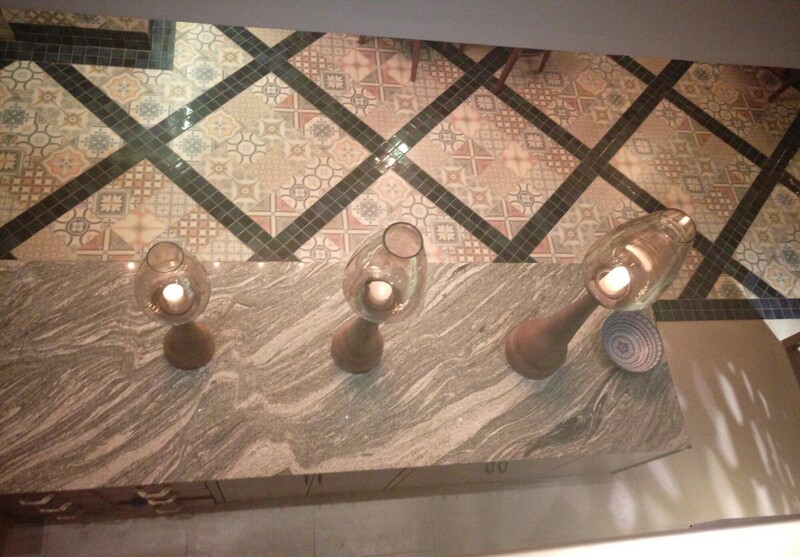 A refreshing dish that usually an appetizer or used as a dip on a plate of salad. Very refreshing on hot summer days as it has cucumber, mint, garlic and olive oil. And this sauce is served with a lot of dishes here. 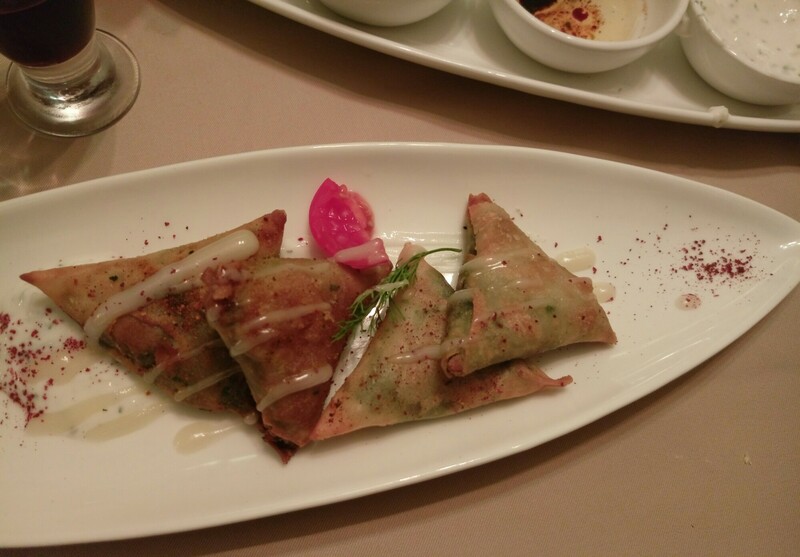 Spinach Fatayer: well while you look at this it might look like a member from the family of Indian samosa but Fatayer is actually a Middle East meat pie that can be alternatively stuffed with spinach. So vegetarian version was stuffed with spinach ( Sabanekh) and feta cheese (Jibnah). 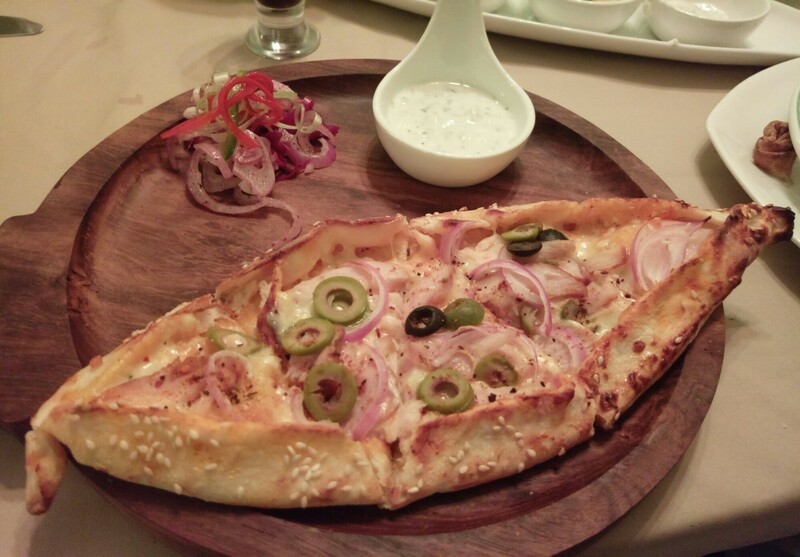 Fatayer is a part of Arabian cuisine and eaten in Iran,palestine, Jordan, Egypt, Syria and Lebanon. It may also be referred as Fitiir. This is also served with cacik sauce. So these triangles are nothing close to our samosas as they have a very thin and extremely crisp outer layer and not at all filling like our samosa so a perfect pick to start with but don’t blame me on deep fried stuff though having a spinach filling ,it is still good for health but not so much. But you are here to eat so indulge. Relish the food and let calorie count take a back seat. 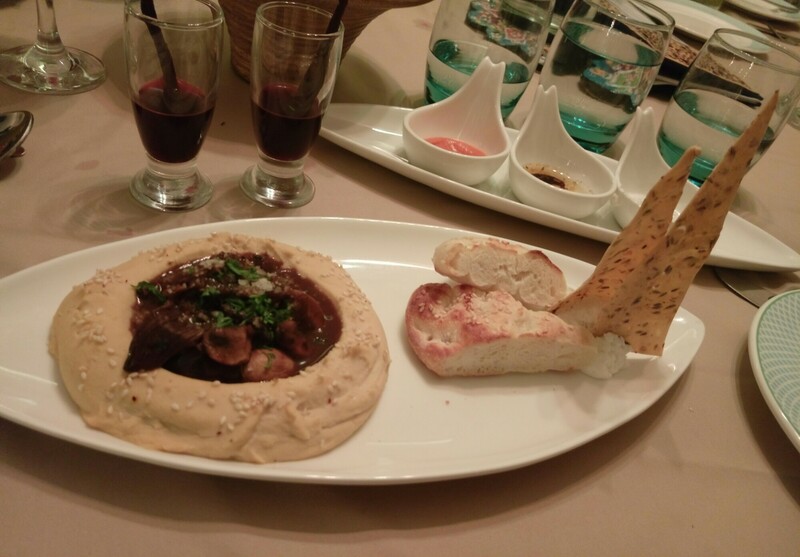 So yet another Turkish dish , it’s sauteed mushroom with onions, garlic ,thyme balsamic glaze Parmesan served with hummus and lavash crostini, well Crostini are Italian appetizers small breads with thin slices grilled and toasted. 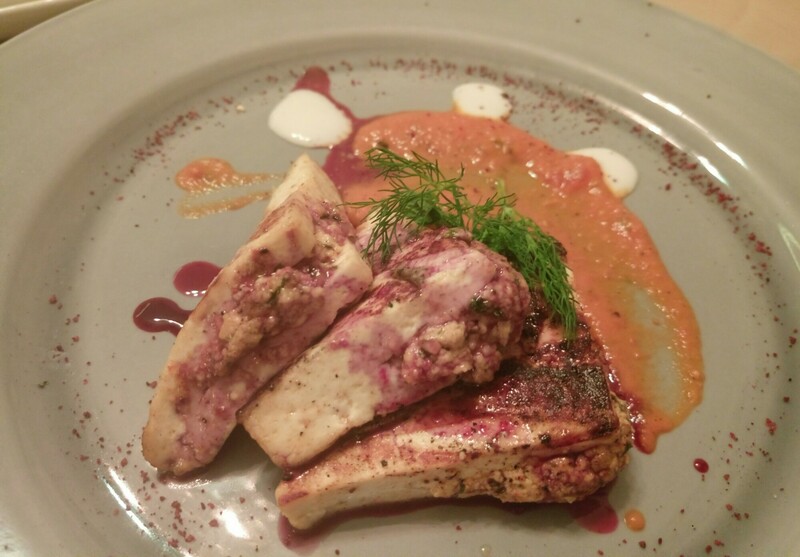 It’s a good dish but don’t try it if you are not up-to an Turkish mushroom dish. Though it tasted really good when had all together. So we went by chefs recommendation for this Paynir ( read it Paneer ) dish it’s basically herb crusted grilled Paneer roasted with tomato sauce and pamo glaze. 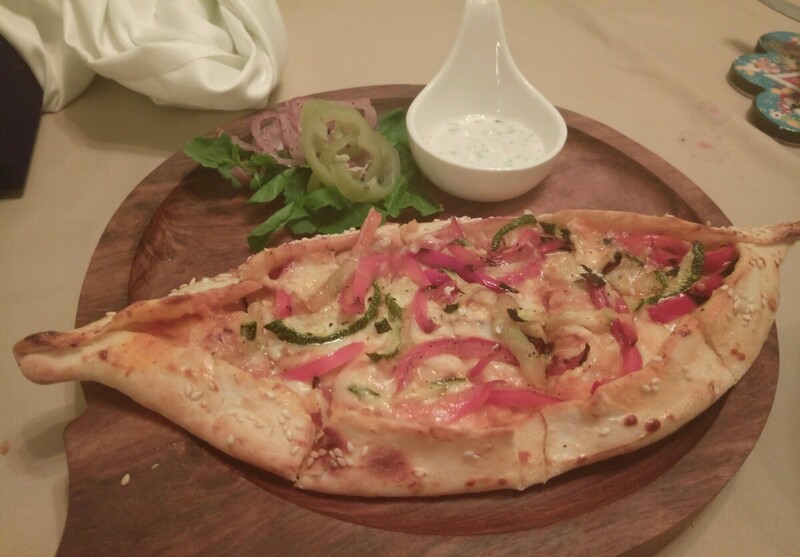 This is yet another Paynir dish ( akka paneer – cottage cheese as they write it). 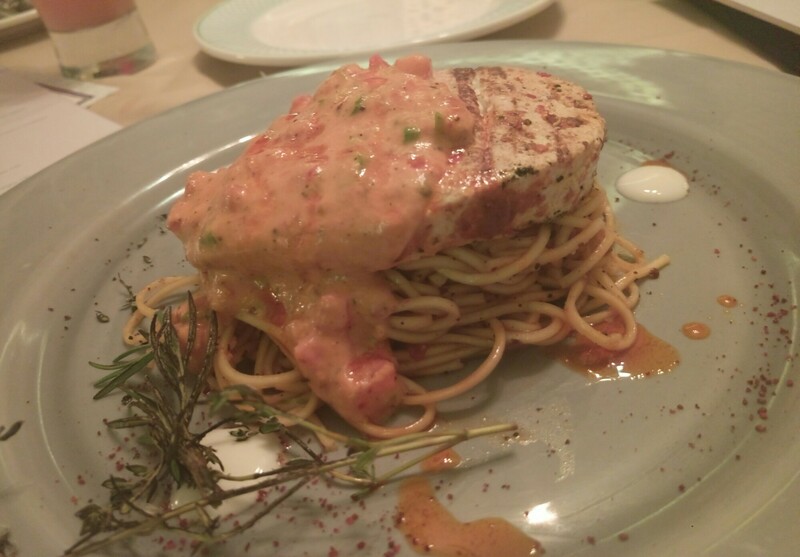 Grilled Paneer served on mahogany noodles and spicy tomato creams sauce. Trust me it was a dynamite of great taste. Perfectly spicy and a hint of sweet to balance the spice and delicious noodles. Pide is the most popular slow cooked fast food, basically a snacks in Turkish cuisine.In few rural areas people make the filling and take it to a baking shop to get it baked. Grilled veggies with fresh herbs baked with mozzarella and feta cheese. So how is it different than our regular pizza? Well, at the site of it you can say it’s the shape. 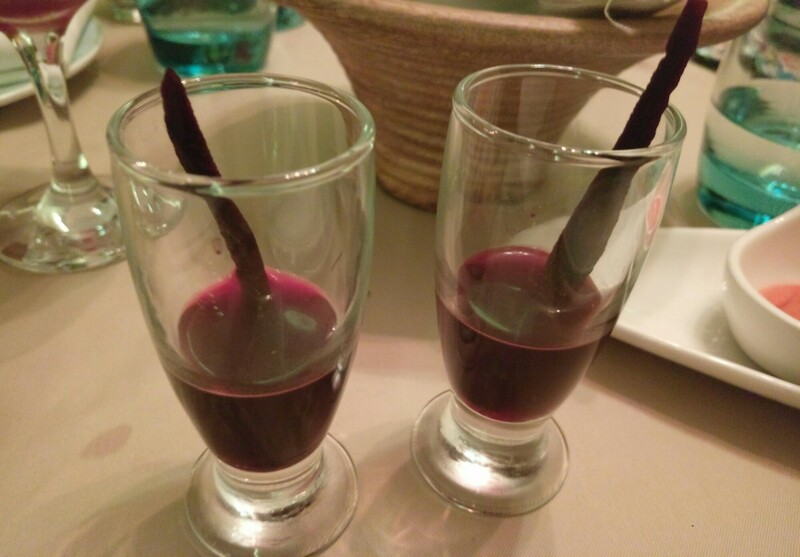 But trust me it’s a bit different in taste too off course its delicious. Well literally enough of food well that’s what I said to my mind while moderating my portion sizes to keep up with my diet. So let’s move to desserts. Caramel braised honey pumpkin infused vanilla citruses burned sugar crust and raspberry sorbet that’s what it derives its color from. While people liked it as it was served but for me it tasted better after the ice cream started melting. This is a great at site dessert and I think half of the eating is done with eyes. 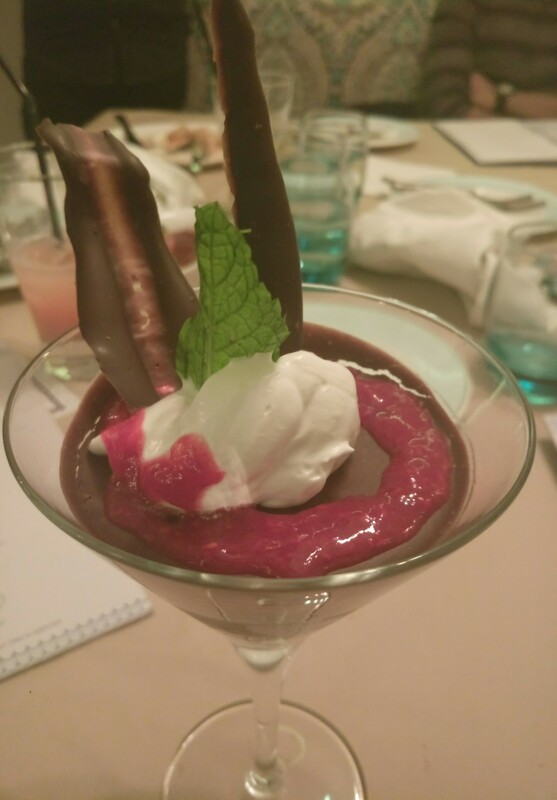 Rich chocolate mousse with raspberry and Turkish coffee and Hazel nuts from the Chefs hometown. And trust me I was sold to this dish the moment it mentioned chocolate and coffee. ( coffee lover u see ). 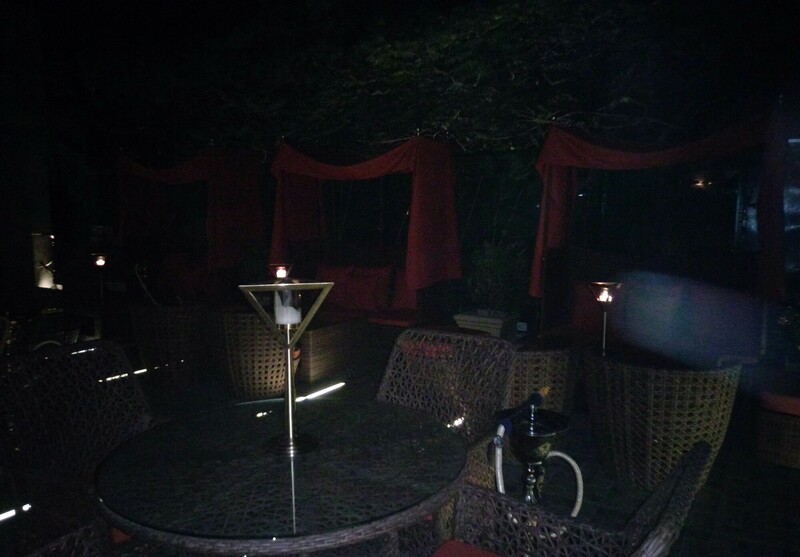 Don’t believe me , have a look for yourself. Hand rolled pillo dough baked in walnut and pistachios and then soaked in cinnamon syrup and topped with home made clotted cream. 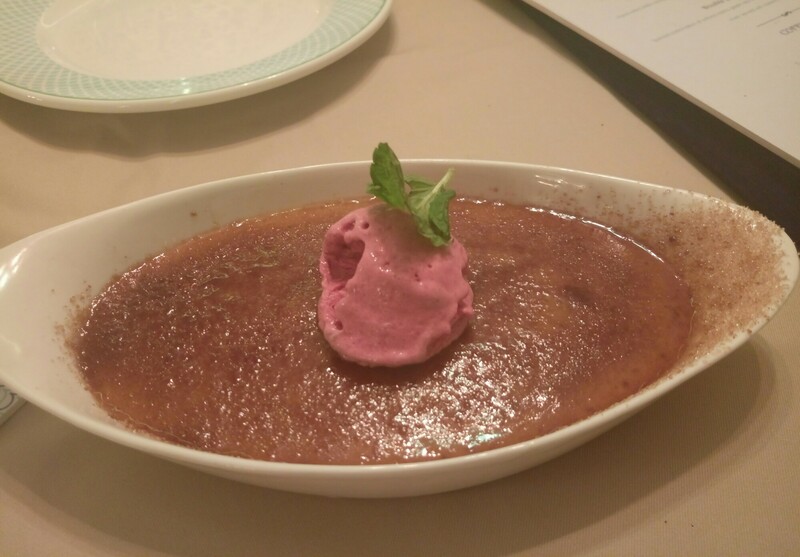 You may find this closer to our Indian desserts like sakkar paare. 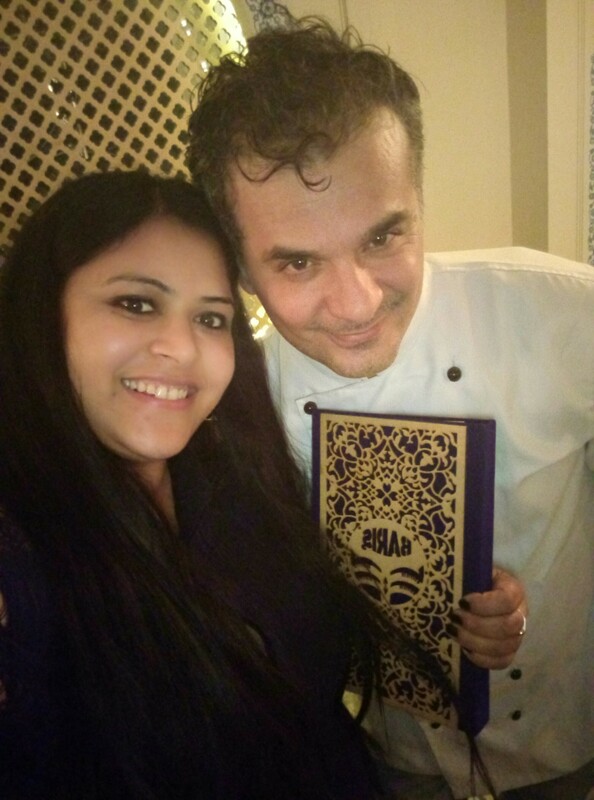 So overall a great experience at this Mediterranean, Turkish & Middle East cuisine and don’t miss to meet the Master Chef here off course he is from Turkey and that’s why we have so many authentic Turkish dishes on the menu and let me tell you the Chef is really a very candid person just like the presentation of his dishes ,with good looks ( read Handsome 😍 ) so that’s Chef Sahib Ibis the curator of all the menu. So boss ek selfie toh banti hai, after all Turkey is on my bucket list on the International destination to go to. 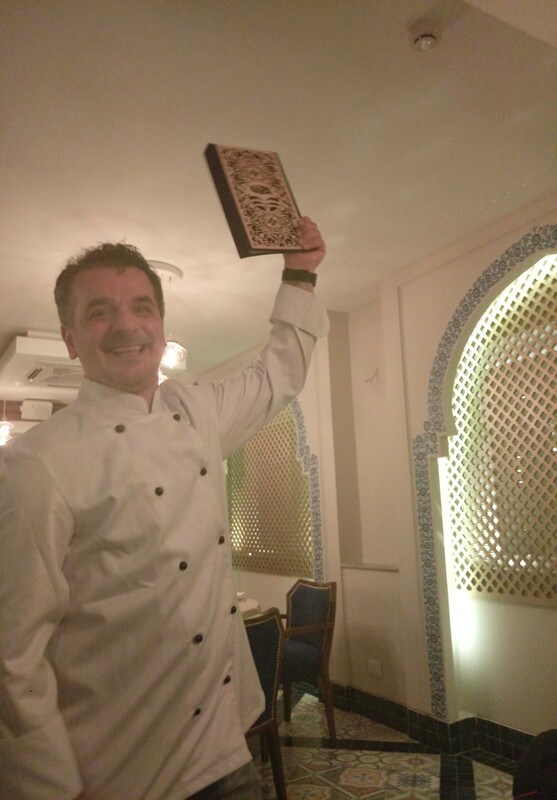 So all the more reason now to explore more yummy food from Turkey.